I have often daydreamed of taking a train ride with all of our gear, throwing it into train baggage car, jumping on board and heading north, only to be dropped off somewhere in the wilderness on the side of the tracks and beside a river. Then have the conductor say good luck and see you soon. Hhmm, sounds like a nice dream. And one day before the holidays started the little one (Kathleen of course) suggested that on our way up to Pukaskwa National Park we should do the Spanish River. Not knowing a lot about the river I immediately started to research the possibility and planning of our new adventure. Of course I knew we were going because Kathleen would not have suggested it unless she had a good feeling about the fun we would have. 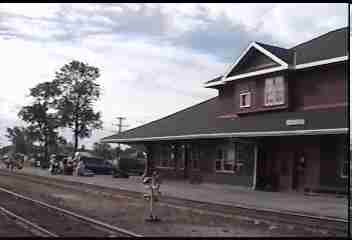 We contacted Fox Lake Lodge (at the Spanish River Elbow), and they suggested to travel there, camp, have breakfast with them and they would arrange for our brand-new canoe, Kicking Frog, our gear, and us to be shuttled to the train station to get on board the choo-choo northbound. How excited can two people get. Packing, organizing, planning for our double adventure went without a hitch. Our drive north was full of anticipation; we hardly noticed the beauty of our great country as we talked about the adventures we were about to undertake. Our greeting at Fox Lake Lodge was wonderful. We were offered a beer and pretzels, and great insight as to the river, water conditions, rapids and where to look for them, and of course the train ride north. Up bright and early, a tasty, filling breakfast and off to the choo choo (my childhood name for trains). We arrive at the station, are dropped off with all of our gear, and then have to wait for 30 minutes for the train to arrive. Probably the most enjoyable time I have ever spent. Ya, you know it. Daydreaming again for the upcoming adventure, one we have not had as yet. The train arrives on time. The conductor jumps from the train and walks along and collects tickets from the waiting passengers, takes instructions from each and then comes to us. Looks like you are going to be with us, how far up the tracks would you like to be let off. Enthusiastically I say, how about a couple of hours. No problem, I know exactly the place, trust me, it will be perfect for your put in. He talks to more passengers and then says those beautiful words, "All aboard". We load our canoe and gear in the "Bud" car, and away we go. The feeling is of course the reason why we do these things, to share something new with the one you love. As we get up to speed and into the wilderness and the beauty of what is happening again, the daydreaming has now become a reality. The noise of the train wheels against the rail, the wind in my face, (because I position myself on the outside platform at the back of the train.) It's important, of course, to take full advantage of every experience. As we move farther up the tracks we begin to travel beside the river, the one we will be on in a couple of hours. I look for landmarks, a bridge trestle, a mountain, a curve or a bend in the river that is unusual, a group of trees at a bend in the river. And then I think how the heck am I going to recognize these landmarks from the river itself. It doesn't matter- I check every detail anyway. I make special note of the whitewater, the length, the height, the rocks, and the shoreline. It's important to scout the shoreline just in case we make a bad move or misjudge a set of rapids. The train stops a few times to allow passengers to unload their summer provisions and belongings. I even have thoughts about their excitement as I see them anxiously unloading. After the second stop the train once again stops just after a train trestle and beside the river. This time to let us unload our canoe and gear. Wow, the heart is pumping with enthusiasm and excitement as we collect our belongings and carrying them the short portage to the river. All loaded, we give each other a hug and away we go on our adventure. The next four days down the river proved to be what we had hoped. Wild life, fast water, large and small rapids, (no spills), calm water to relax, old historic buildings, shallow rocky bottoms ( and that horrible sound of scraping and gouging the bottom of our brand-new Kicking Frog. The campsites we chose, the wonderful meals, the fires, and the times when we reflected on our day. Perhaps I will continue our story another time.